It has been a double whammy for farmers this year. While still recuperating from an erratic monsoon, farmers in at least nine states—Odisha, Maharashtra, West Bengal, Telangana, Gujarat, Andhra Pradesh, Assam, Tamil Nadu and Rajasthan—are reeling under severe pest attacks. This year’s monsoon season was characterised by long dry spells, followed by short spells of heavy rains that affected farmers in the nine states. And now, farmers are reporting widespread pest attacks. 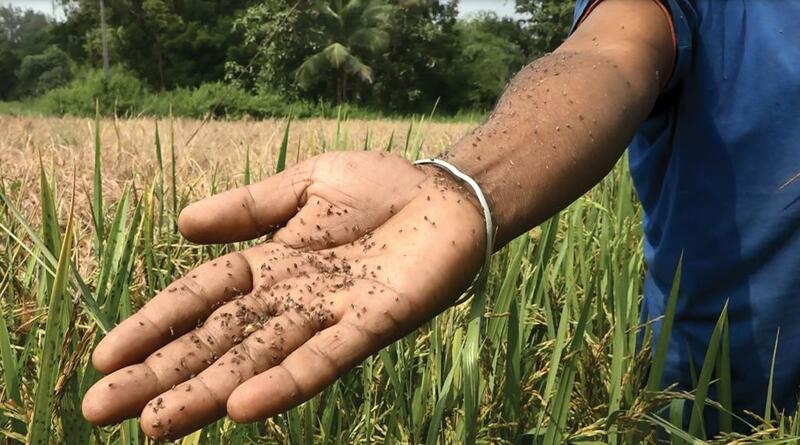 Brown plant hopper (BPH) infestation has already destroyed 180,000 hectares (ha)of rice plantations in 15 out of the 30 districts in Odisha, as per state government estimates. What is worse, farmers incurred further loss as they had to go for a premature harvest due to unexpected heavy showers between November 14 and 18. An unprepared state government has instructed district collectors in 22 districts to take up pest control measures. Meanwhile, desperate farmers have burnt land patches hit by BPH, but pest attacks continue. The pest has also destroyed over 1,000 ha of the paddy crop in four Telangana districts—Karimnagar, Jagtial, Peddapalli and Sircilla. In Maharashtra, farmers are fighting White Grub pest that has attacked sugarcane, groundnuts, soyabeans, onion and paddy fields. Even finger millet is under attack from the Ear Head caterpillar. “Pest attacks can lead to a 20 per cent lower yield in Maharashtra this year,” says Pandurang Babasaheb Mohite, head, entomology department, College of Agriculture, Kohlapur, Maharashtra. Mohite, who is also the principal investigator at the Indian Council of Agricultural Research-funded All India Network Project on White Grub, adds that sugarcane farmers in south and central Maharashtra, the key growing regions, have already suffered damage due to pest attacks. In Assam’s Lakhmipur district, paddy farmers have lost over 500 ha to a pest called Paddy Swarming caterpillar. 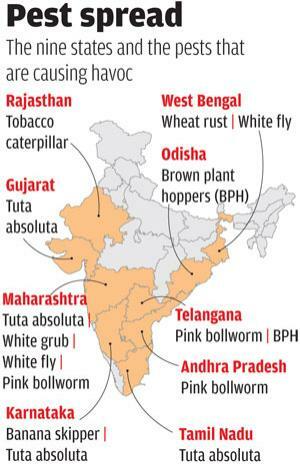 Farmers in Telangana and Andhra Pradesh have lost standing cotton crops to Pink bollworm, a type of caterpillar. Pest attacks have also been reported in banana plantations in Karnataka. “A pest called Tuta absoluta has been regularly attacking tomato, eggplant and capsicum crops in Tamil Nadu, Gujarat and Maharashtra since 2006,” says A K Chakravarthy, an entomologist from Bengaluru. Dry spells during monsoon have led to pest attacks and undergrowth in kharif crops in Rajasthan’s Hadauti region, triggering concerns among farmers ahead of the harvest season. Tobacco caterpillar, a typical soybean crop pest, has infested the crop. “It has already affected 20 per cent of the total crop area in the region,” says Hari Prasad, assistant professor, entomology, Agriculture University, Kota, Rajasthan. West Bengal is facing a peculiar problem. After a wheat blast disease outbreak in Bangladesh, there are fears that the pest might spread to the state’s border districts of Nadia and Murshidabad. As a result, the Centre has announced a wheat crop holiday for three years in the two districts, which have over 1 20,000 ha under wheat farming. “We are encouraging wheat farmers to grow pulses, lentils, mustard and plan to set up 200 mills to process pulses,” says Pradeep Majumdar, agriculture advisor to chief minister of West Bengal. “Wheat Blast disease originated in South America and reached Bangladesh due to poor quarantine measures. We need to be proactive so that it does not affect Indian farmers,” says Gyanendra P Singh, director, Indian Institute of Wheat and Barley Research, Karnal, Haryana. While most states in India lose five to 10 per cent of crops to pest attacks every year, the scale and intensity of the recent attacks is a cause for concern. Experts believe climate change, along with the indiscriminate use of pesticides, could well be the reason for this sudden surge in attacks this year. “Elevated carbon dioxide (CO2) can increase levels of simple sugars in leaves and lower their nitrogen content. This can increase the damage caused by many insects, who will consume more leaves to meet their metabolic requirements of nitrogen. Thus, attacks will be more severe. Higher temperatures due to global warming will mean that more numbers of pests will survive the winter season,” says S Venkatraman, an agrometeorologist who has worked with the India Meteorological Department. Mohite says pests thrive in a dry and warm environment, and the recent spread of drought-affected regions have made the environment conducive. “While there is no official data on pest outbreaks, it was extremely high in the drought years of 2014 and 2015. In 2016, when the monsoon was near normal, the country produced record grains,” says Mohite. This year, while the country received 841.3 mm rain between June 1 and September 30, just five per cent less than the normal, the distribution was unequal. The monthly rainfall pattern, which matters the most to a farmer, suggests that after heavy rains in June (4 per cent surplus) and July (2 per cent surplus), August (13 per cent deficit) and September (13 per cent deficit) was drier than usual. “The White Grub pest attack would not have been this widespread had it rained normally in August and September,” says Mohite. Mayabini Jena of the National Rice Research Institute in Odisha says the rate at which pests lay eggs increases in a hot environment. Angelika Hilbedc, who works with the environment science department of the Swiss Federal Institute of Technology, says BPH attacks are due to overuse of pesticides that make pests resistant. “BPH outbreaks are more severe now because of the use of hybrid paddy along with fertilisers with high urea and ammonia content,” says G V Raman-janeyulu, agriculture scientist, Centre for Sustainable Agriculture, Hyderabad. So what is the solution? Crop rotation, says Biswanath Bandopadhya, head of department, entomology, Bidhan Chandra Krishi Viswavidyalaya, Nadia, West Bengal. “BPH outbreaks had become a regular feature in Hubli district in the past few decades. We successfully controlled the outbreaks by changing the paddy varieties grown in the area and the cropping pattern,” he says. Debal Deb, an Odisha-based plant scientist turned conservationist, says breaking away from the traditional farming practices have also increased pest outbreaks in the country. “The tradition of community bonfires during Diwali was a good way of containing pest population in villages. Over the years, people have shifted to electric lights and this has meant a pest population explosion,” he says. (This article was first published in the 16-31 issue of Down To Earth, under the headline 'Wipeout').